Curb bits don't work miracles on fractious horses, but, used properly, they can certainly help. Used improperly, they can ruin. "Using a curb bit is like using hot red pepper in soup," Susan Harris says. "Just enough is good, but too much ruins it. You use a curb bit on a horse to work in a collected mode. With a curb, your horse should respond with his whole body. You don't have direct pressure on your horse's mouth like you do with a snaffle bit. What you do have is more pressure." With a snaffle, two ounces of pressure on the bit results in two ounces of pressure on the mouth. But if you put two ounces of pressure on the reins with a curb, there could be four, six or even eight ounces of pressure on the mouth. To get a feel for the pressure, the Cortland, N.Y., Pony Club instructor advises taking the bridle off the horse and putting your fist between the mouthpiece and curb chain. Then pull back on the reins. "You'll be amazed at the pressure," Harris says. "I don't think anybody should get to use a curb bit until they try that." The curb bit consists of a mouthpiece with shanks on each side. The upper shank sometimes has a bridle ring or a separate ring for the curb chain. The lower shank has rein rings on the bottom. "The curb bit works by rotation, so when you pull the reins, the bottom of the shank goes back and the top goes forward," Harris explains. "The curb chain, or strap, tightens, squeezing the jaw, and the bridle presses against the poll." Riders have the choice of several types of curb bits: pelhams, kimberwickes and full bridles for the English riders. A pelham is a curb bit with a snaffle rein and curb rein; use the top rein for snaffle action, the bottom rein for the curb. A problem occurs, however, when a rider indiscriminately pulls on both reins, making the bit neither a curb nor a snaffle. "Pelhams don't require as much �touch' as a full bridle, but you still have to remember that you have quite a bit of leverage," says Harris. The kimberwicke is the mildest form of the curb, especially with the reins on the upper slot. "But even the kimberwicke, if used wrongly, can be harsh," Harris warns. Advanced dressage riders use a curb bit in combination with a snaffle or bridoon, known as the full bridle. "The snaffle bends and controls the horse, while the curb keeps the horse collected," Harris says. "This takes a very good rider with an independent seat. I always say riding with a full bridle is like conducting an orchestra. It takes a maestro to do it well." Mouthpiece size and shape make all the difference when selecting a curb. A slight port actually allows the horse's tongue to be relieved of pressure when the bit is pulled. A port that is smooth and slanted slightly backward is more comfortable than a port that is straight up. "A straight bar really squeezes straight down on the horse's tongue," says Harris. "But a port allows room for the tongue if it is fairly wide and comfortable for your horse. The bit then puts pressure on the bars, not the tongue. You need to find which mouthpiece is comfortable for your horse." High ports are likely to touch the roof of the mouth. "Contrary to what people think, this isn't so bad, as the roof of a horse's mouth is not that sensitive," Harris points out. A curb bit should have a moderately thick mouthpiece. "You need a thickness that suits your horse. If it's too thin, it concentrates the pressure," Harris notes. "Too thick a bit really can overload a horse's mouth." She also cautions against any curb bit that projects downward; it digs into the tongue when the bit rotates. "A jointed mouthpiece in a curb also causes the same problem � when the bit rotates as the bottom shank is pulled, it also pushes down on the tongue." Bits made of sweet iron, copper or stainless steel are most comfortable. According to Harris, aluminum tastes bad to horses and dries the mouth. Proper adjustment of the curb chain is essential. The bit should rotate back 45 degrees when you pull on the bottom rein. "Two-fingers between the curb chain or strap and your horse's chin is a very rough guideline," she says. "It's more important to make sure the bit can rotate 45 degrees. Be sure that your curb chain or strap is flat under the jaw, not twisted or rough. With an English curb bit, twist the chain toward the horse's chest until it lies flat." Inspect closely. Sharp points where the mouthpiece is attached to the shanks can bother the horse. When fitting a curb, it should fit right in the corner of the lips, not be pulled up tight. You also want to make sure the mouthpiece fits. Too wide and it will rock from side to side in the mouth. Balance also plays a role. "The weight and balance of the curb makes a difference as to whether the bit encourages a horse to tuck his nose in, or put it out a little," Harris says. "If your horse is throwing his head up when you're stopping, look to yourself first. Make sure you're using your hands properly. 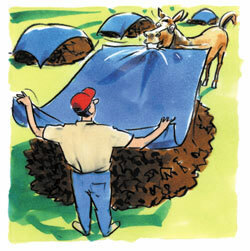 Then make sure that the bit is adjusted properly and that it is the right bit for the horse." Before you stop a horse in a curb bit, let him know your intentions. "You first indicate a stop with your body, shifting your weight back a little bit," says Pony Club instructor Susan Harris. "Pick up the reins gently so your horse feels it and gets ready. Then give the command with your voice and a touch and release on the bit. "Nothing makes a horse as miserable as someone hauling back on a curb bit," says Harris. "If you keep hauling back and not using a touch-and-release, his mouth will eventually go numb. Then you'll really have problems. The fastest way to ruin a horse is to pull hard and long on the curb bit; you'll have a ruined horse in a week." Rebecca Colnar is editor of The Mane Points. �Southern States Cooperative, Inc., Reprinted from Mane Points magazine, with permission of Southern States Cooperative, Inc.